The Guild's 2017 Exhibition was a wonderful event and we were absolutely delighted with the number of visitors and with all the lovely comments they made to stewards/demonstrators and/or left in the Visitors' Book. Buckfastleigh’s location on the edge of Dartmoor was perfect for wool production: large flocks of sheep could graze on the moorland and the waters of the local rivers (the Dart, the Mardle and the Dean Burn) were used process and dye the fleeces. The Exhibition was split over the two floors of the Guest Hall. Articles made by Guild members were displayed on the top floor where there were also demonstrations of tapestry weaving and spinning, a wonderful display of natural and chemical dyeing techniques and samples of wool and fibre for visitors to feel and compare. 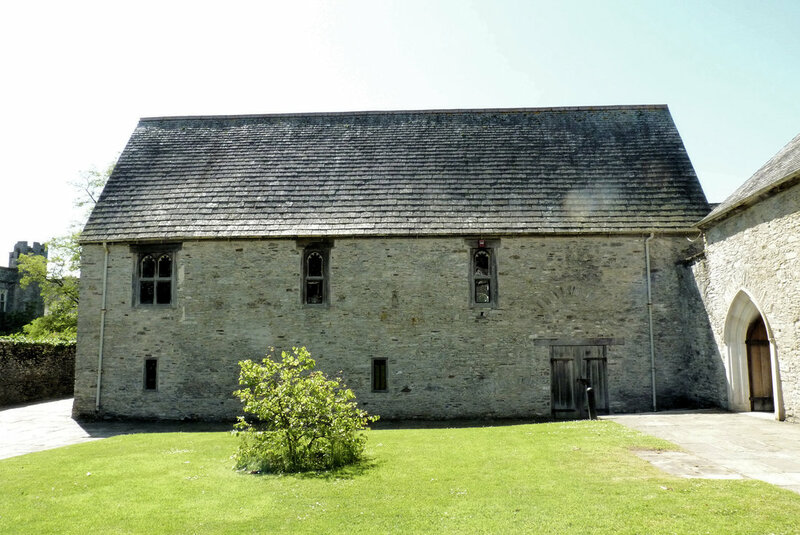 Downstairs there were more demonstrations and opportunities for visitors to have a go (weaving, blending, inkle loom weaving, spindling, wheel spinning) and a large TV screen showing a loop of photos of the first floor for those who couldn’t make it up the stairs. Items for sale were also available on the ground floor and trade got quite brisk at times! In line with the Guild's aims (to preserve and improve the craftsmanship in hand weaving, spinning and dyeing for the benefit of the public and to promote public education in such craftsmanship) we also displayed posters which gave information on the processes used in our crafts and these proved very popular. We hope that the slideshows below will be interesting to Guild members and visitors who were unable to get to the Exhibition ... and a reminder to all those who did get to see everything themself! 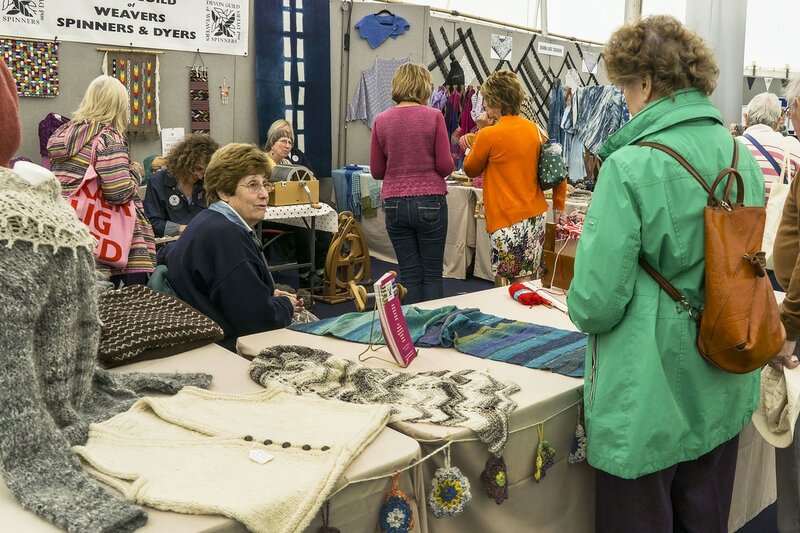 The Guild would like to thank all the sellers who came to this year's Fleece & Fibre Day - Guild members and visitors alike had a wonderful time cooing, fondling and admiring and hopefully they parted with enough of their hard earned cash to encourage you to return next year. An extra 'thank you' must go to John and Juliet Arbon and Mike Black who went beyond the call of duty and helped us pack the tables away! At the risk of this beginning to resemble an Oscar speech ... thanks also to the providors and servers of tea, coffee, cake and quiche. After all, sustenance is required to fuel a spending spree! These photos show just a small glimpse of what was on offer but does little to illustrate what a fun event it was. N.B. Some of the photos are linked to the seller's website - just click on the photo and their website will open in a new browser page. 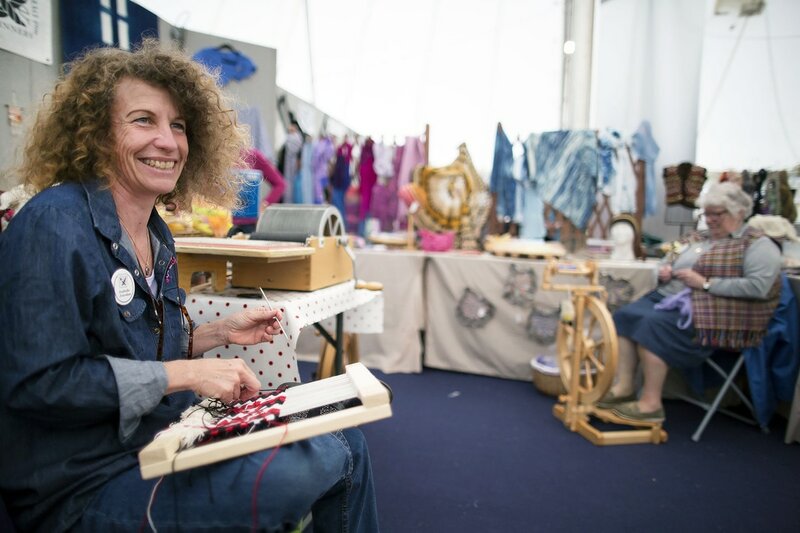 Jane Yarrow and Pam Brown set up a colourful display at this year's Mid Devon Show and visitors to the stand were encouraged to handle numerous samples of British fleece and yarn spun from the different types of sheep. Mini-skeins of wool showed the variety of colours available from natural dyeing sources and techniques. 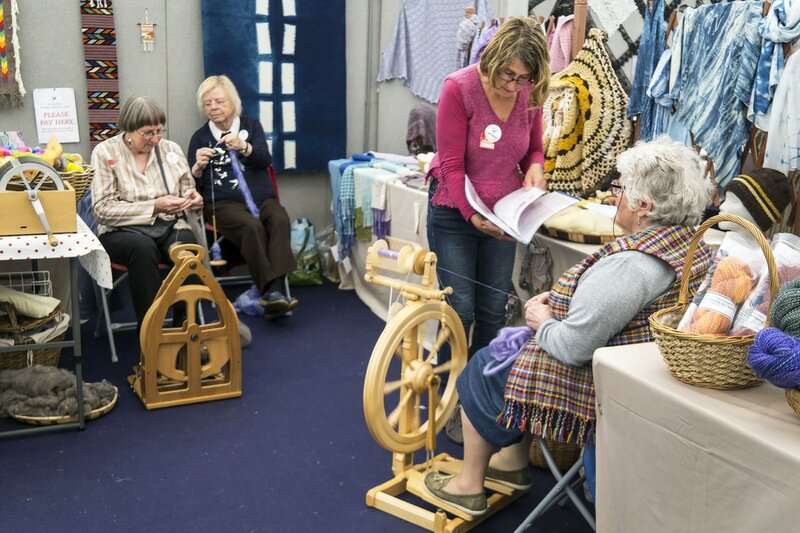 Jane and Pam were joined by four other Guild members and throughout the day all were kept busy by numerous and wide-ranging questions and had fun demonstrating and teaching people of all ages to blend and spin fibre. 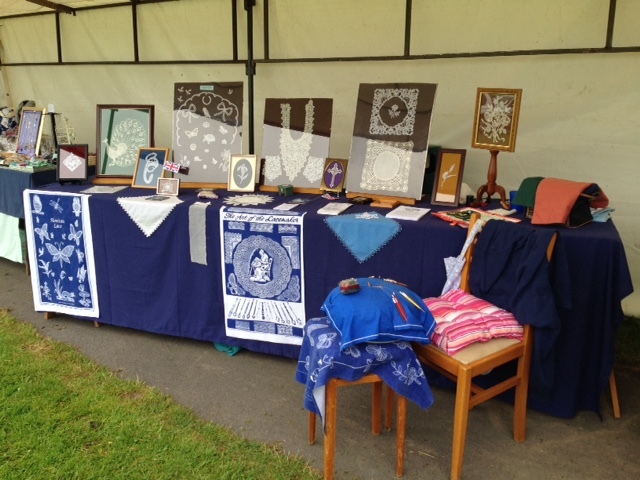 Guild members Norma Sanders and Jill Bond set up a display of spinning and lace at this year's Tatworth Vintage Rally, near Chard. Higher Nichols Nymet near North Tawton was the venue for the Sheep Show and our Guild was delighted to be invited to have a stand. We were situated in one of two sheep marquees positioned between the Wool Board and the sheep pens. There were so many breeds of sheep to study, some old favourites and unfamiliar ones too. 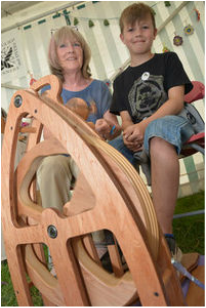 Visitors stopped to peruse our stand, watch the spinners busy at their wheels, spindle spinning and drum carding. 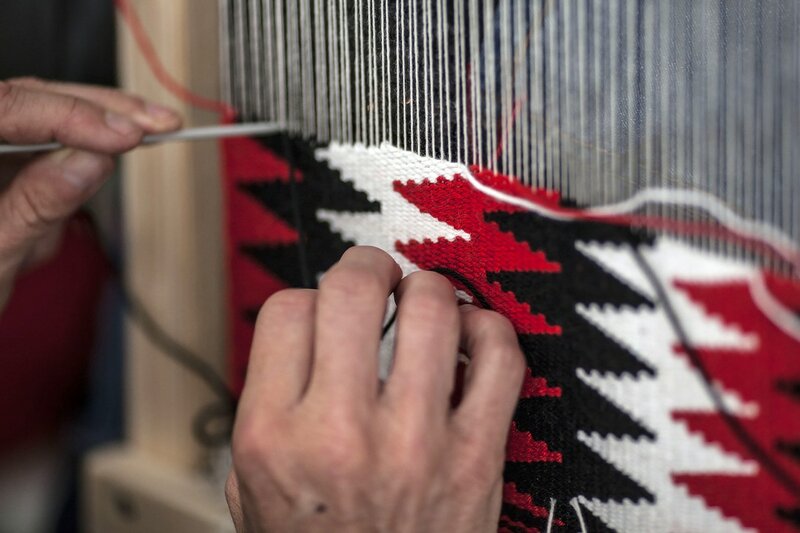 A group of school children visiting found the drum carder an attraction and they all wanted a go at turning the handle and adding the colours and each one was able to add a sample of colourful batt to their show 'goodie bag'. All the Guild members demonstrating had a great day surrounded by sheep and fleece ... what more could a handspinner desire?! 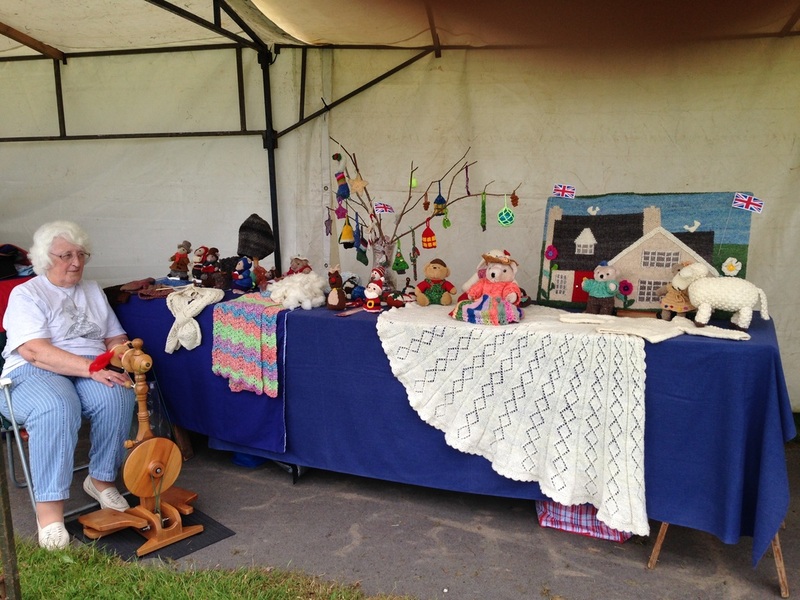 We were delighted to have a stand at Proper Woolly, the first fibre festival held in Devon for some years. There was a real buzz amongst stallholders and visitors alike and we very much hope the organisers will quickly forget what hard work it was and start planning Proper Woolly 2016! 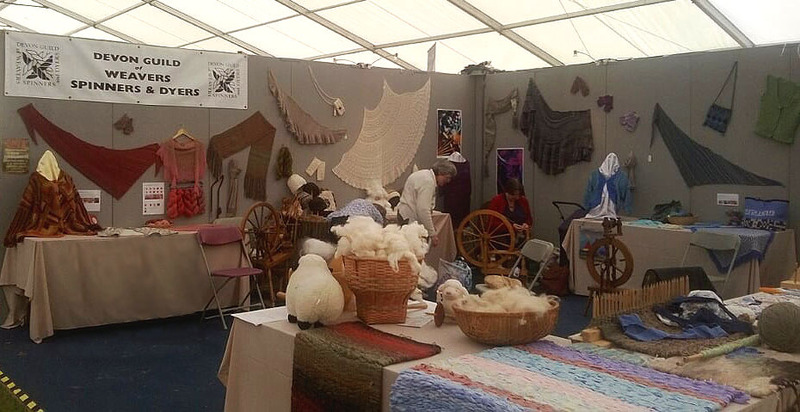 Throughout the Show we had enormous interest from adults and children and we were frequently rushed off our feet teaching them to spin, spindle and weave. Children in particular were fascinated by the blending board and many of them were able to take a short length of yarn spun from rolags they had prepared themselves. We would love to show you photographs of all this going on but there were no spare hands available to take the snaps! The gallery below gives just an overview of our stand and the wide variety of items displayed. 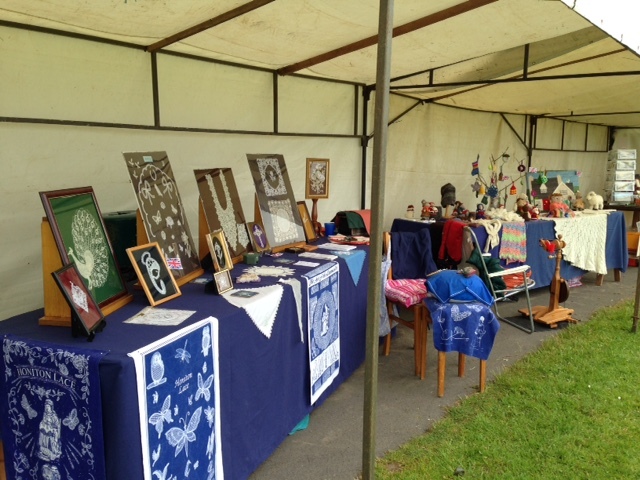 Every year the Rousdon Spinners (all members of the Devon Guild) exhibit at the Axminster Festival. The theme for 2014 was 'Nursery Rhymes' - all the items displayed are handspun and knitted and/or felted. Norma Sanders took the photograph and behind the table, from left to right, are Brenda Patten, Pippa Brough and Linda Studley.